One of our favorite importers is Neal Rosenthal. He’s been in the wine business a long time and still manages to find interesting, classically made, beautiful wines. Unfortunately, many of them rarely make it to Michigan. So we’ll occasionally do some research on wines from his portfolio and make special orders for wines we find intriguing. The latest such bottle is from Swiss producer Cave Caloz from a region in the Alps, near the northernmost end of the Rhone river, called Valais. 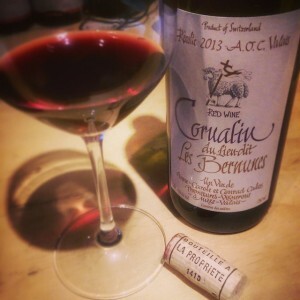 The wine is made from a charming, difficult-to-grow, unheralded grape called Cornalin (also known as Rouge de Pays) that is almost exclusively grown in Valais. Vineyards here are often 750 to 1100 meters in elevation – one might think too cool for making wine. But they generally face south giving them full exposure to the sun and to warm Mediterranean winds that come north from the sea. The rocky environment allows for good drainage which the winemaker maintains gives their wines both extra concentration of fruit and a decided mineral character. The specific vineyard from which this wine is made, “Les Bernunes,” is one of their highest elevation and sits in a microclimate that Caloz again maintains helps the grapes express great concentration of flavor and added tannic structure. Graceful and fruity, this is a deeply colored, almost purple-tinted shade of red. Very lively, it’s just fun with ample floral and fruit notes. But it’s simultaneously serious wine with nice, refreshing mineral qualities and just a bit of a tannic edge to the finish. With a slight chill, it’s a perfect summer red.